Really you guys.. I wonder how motivated these previous homeowners were to sell their house? Number 1 rule: Never leave laundry on your countertops during showings. 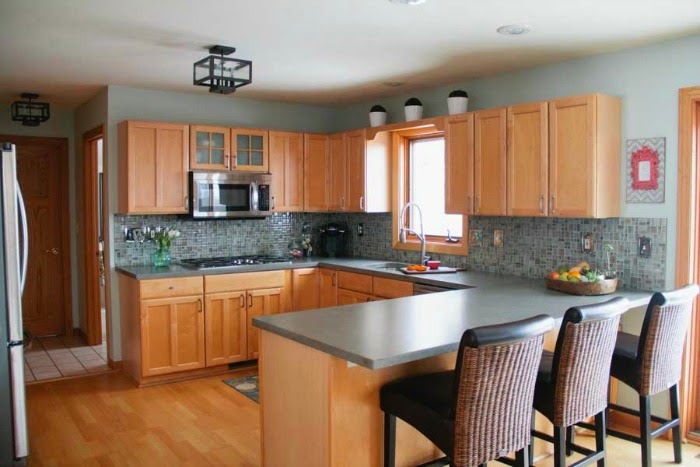 Number 2 rule: Clean off your countertops when trying to sell your home. Ha! Kidding of course, I think those may be unspoken rules, but I would think they are both common sense? Oh well, we still bought it, so obviously we saw past it. One of my biggest pet peeves is wasted space, and no attention to details. Ok, maybe that's two, but honestly. Not only is there NO architectural beauty in our upper cabinets, (a little crown moulding would have been nice), but imagine how much more storage space you would have gained if you brought them to the ceiling? I would LOVE to eventually add some details to the top of these, but that is not in the budget. So for now, just taking the dust collectors off from the top made a huge improvement. 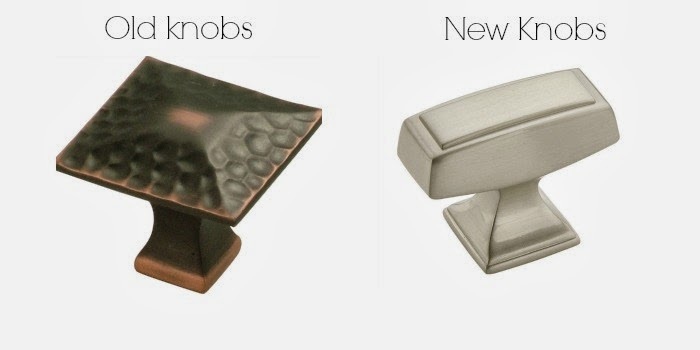 Changed out the knobs on the cabinetry. This was the EASIEST and most economical fix! 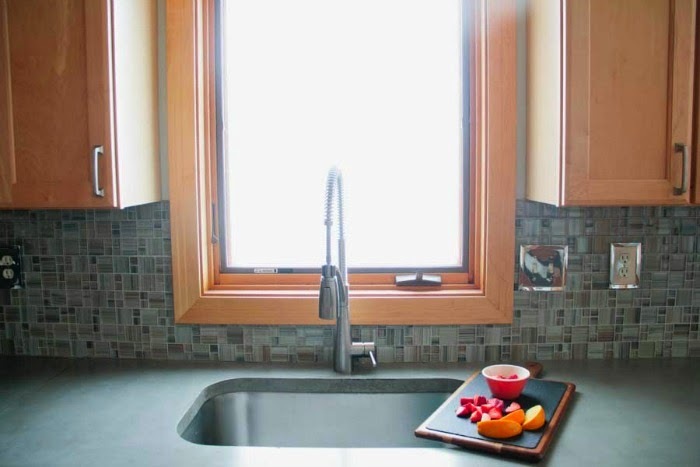 Change out the countertops. You can't see it here, but the seams were popping up in the corners. Sorry for the horrible picture. I snapped this shot right before my husband demo'd them, and all I had was my phone. The sink and faucet also needed to be replaced. It was a white, cast iron sink, and we all know what happens to that over time! Switch the appliances in order of worst to best. We started with the one's that NEEDED to be replaced. The cook top was a mess. There were two burners (one of which worked) and the other was a large griddle. Not super practical for a family of six! 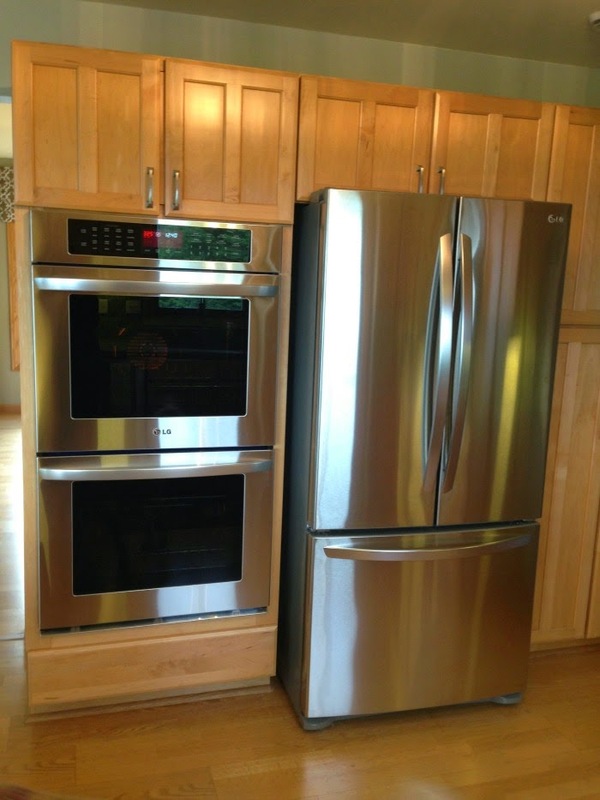 I was super spoiled in our old home and had a double oven…. While this wasn't a need, it comes in super handy when entertaining. 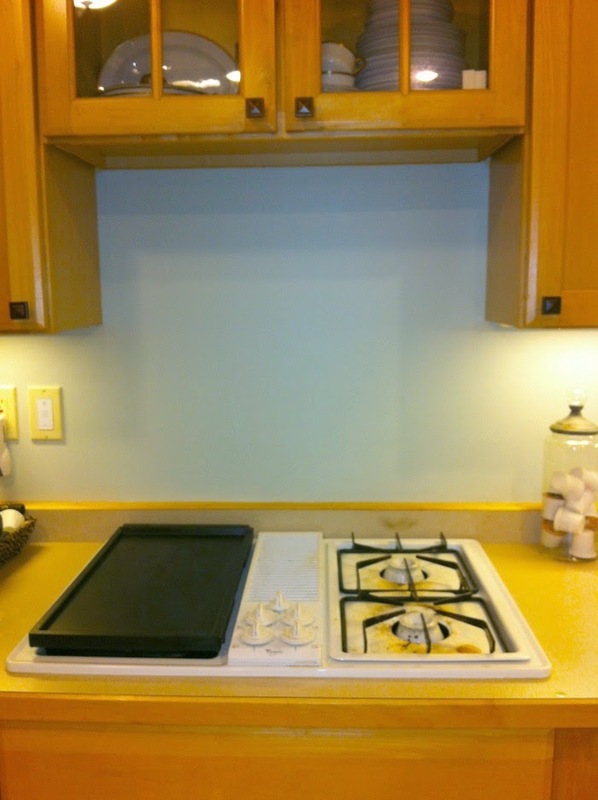 The space above the cooktop really bothered me (see above pic)... 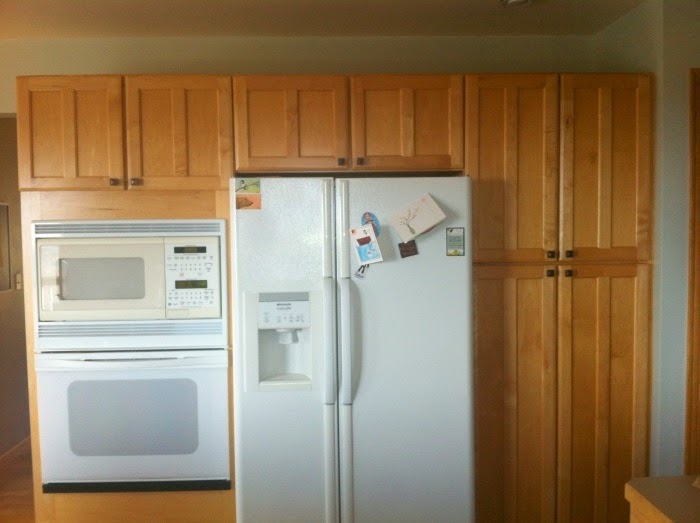 There could EASILY be a microwave there, and instead…more wasted space. Here is a snapshot of the AFTER! 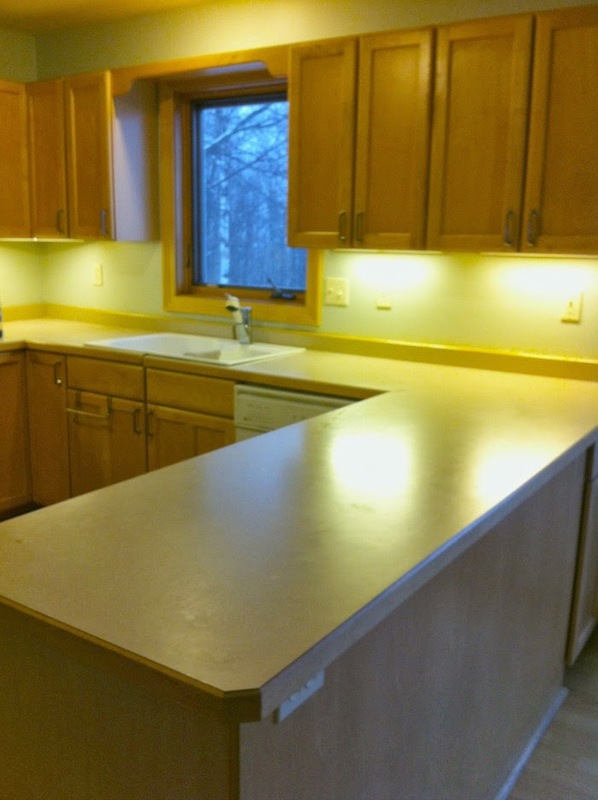 We started with the replacing the countertops. I knew I wanted a solid surface. Quartz was honestly my first choice, but with a hefty price tag, we went with our second choice... concrete. I LOVE, LOVE, LOVE the way they look. I do have to say, they have not been as forgiving as I had hoped, but after much more research, it looks like it may have to do with the sealer our installer used. That, hopefully, is an easy fix! The cooktop was expanded to a five burner, and converted over to gas. Once you go gas, it's hard to go back. True story. I can't imagine cooking on an electric again! 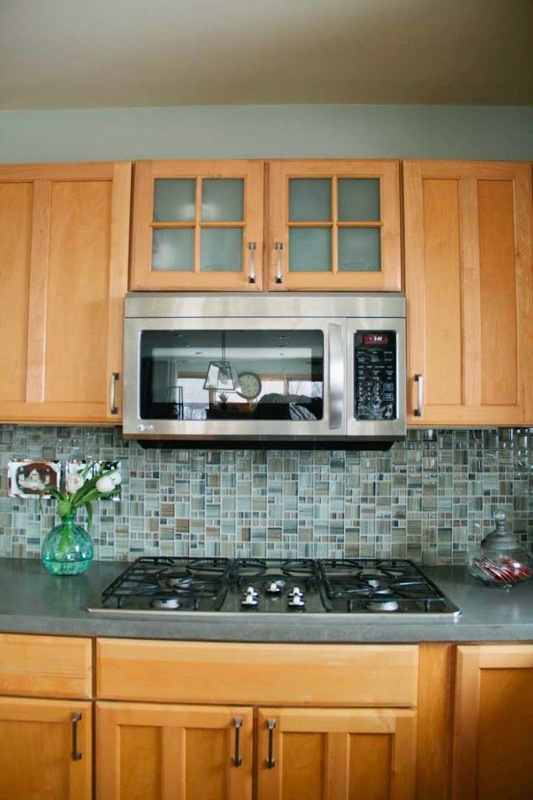 We hired a handy man to come shave a few inches off our upper cabinet so we could accommodate a microwave. An electrician came and added a power outlet to the uppers and we frosted the glass to disguise the cords. 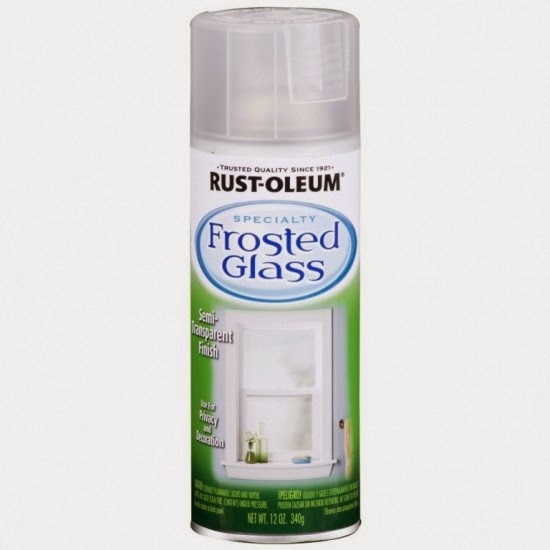 Would you believe me if I told you that a can of this can create the look of high end glass? No joke! 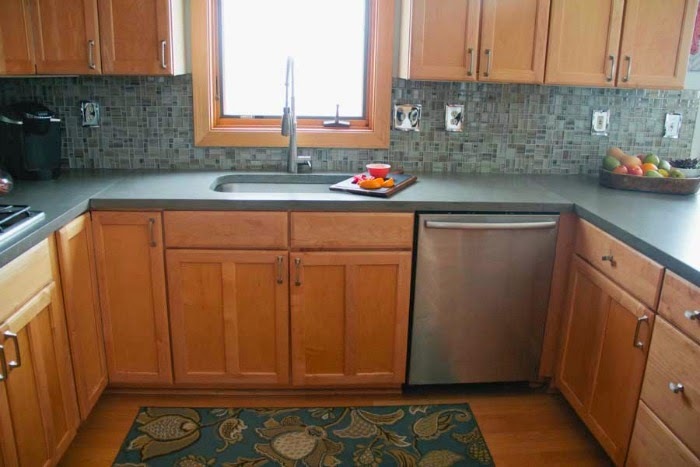 Remember the before where we had a microwave/oven combo here? Since we moved the microwave, I could now have my DOUBLE OVENS back!!! (insert happy dance here)!!!! I went with a more industrial looking faucet, and a large stainless steel sink. This sink is da bomb! It is timeless and SO, SO easy to clean. I'm a sucker for easy maintenance! 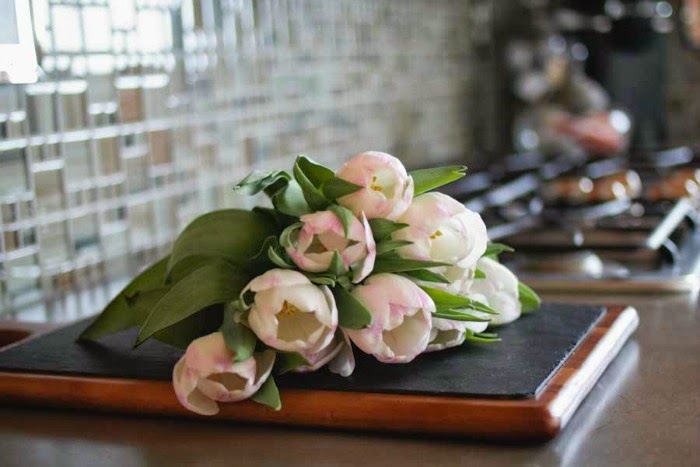 With the concrete and stainless, I'm all about bringing in softer touches to our space. 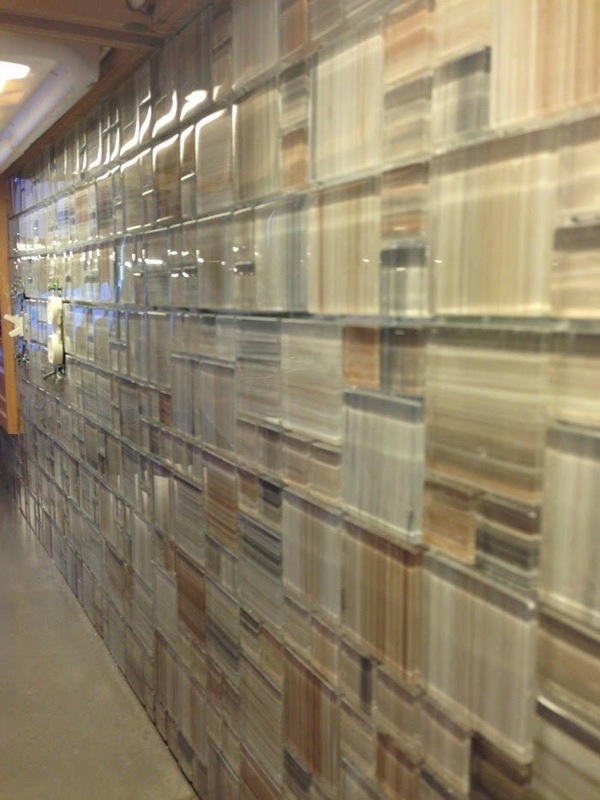 I think the glass tile helps balance this out as well. Lucky for me, my daughter works at a floral shop where I can get fresh flowers on a budget as often as I like! 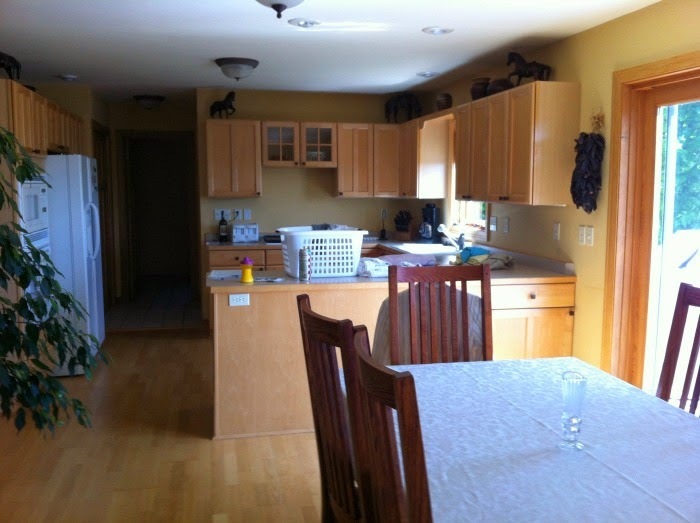 One last thing… When we replaced the countertops we did what should have been done in the beginning… extended them! The space is large, and had no problem supporting a eat- in area!! (you can see the overhang from this view here). So, what do you think? Not a major re-haul, but definitely an improvement?! 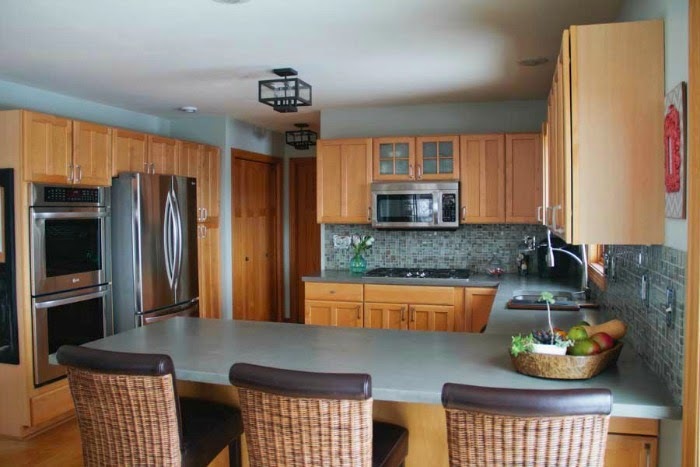 Is concrete more reasonable than granite or silestone? Thanks Beth! The concrete stains easily and scratches easily, but like I said, I think it's just a bad sealer on the top. Hopefully we can make it more durable =) I can't wait to start your basement!!! So we just installed concrete countertops...they def. dont look as lovely as yours! I think our contractor was a newbie to be honest and took on more then he could chew :( Any tips of how to improve? He used a high shine sealer on it called sealbest. The edges are extremely rough and the top is not smooth AT ALL, level but feels like sandpaper! I dont want to redo them but I'm thinking there is maybe a coating I could put on to smooth it a bit?